"The human body is the universe in miniature. That which cannot be found in the body is not found in the universe. Hence the philosopher's formula that the universe within reflects the universe without." Deep-cleanse, exfoliation and masque using the power of flowers, plant oils, raw honey and herbal infusions. A combination of facial massage techniques including acupressure, fascia tension release, cupping, crystal healing and kansa are incorporated based on our consultation and time alotted. *Extractions only included in the Clarity Acne Ritual Facial. Rejuvenation of the scalp muscles, feet, hand/arm and shoulders enhances your overall wellness and is experienced in every Holistic Facial Ritual. *All first time guests receive a complimentary 30 minute consultation while enjoying the signature Misaotra Grounding Foot Bath. Please take this time into consideration when planning your schedule. For example: a 60m treatment can take and a hour and a half, a 90m treatment can take 2 hours. Allow time for consultation, changing into spa robe and home-ritual recommendations. with deep oil condition and hair brushing. The ILLUME Sculpt & Lift Facial is a dynamic anti-aging facial therapy that uses a patented nephrite jade gua sha tool to instantly minimize wrinkles and fine lines, lift eye lids, reduce sagging and puffiness and help diminish blemishes and dark spots. A series of 8-10 weekly sessions is recommended for maximum results. After all, it's like yoga for your face. The more you practice, the more toned and vibrant you become. Please see ILLUME Sculpt & Lift page for more details. This healing facial provides powerful exfoliation to clear congestion, eliminates surface toxins, and improves skin's overall appearance and texture. 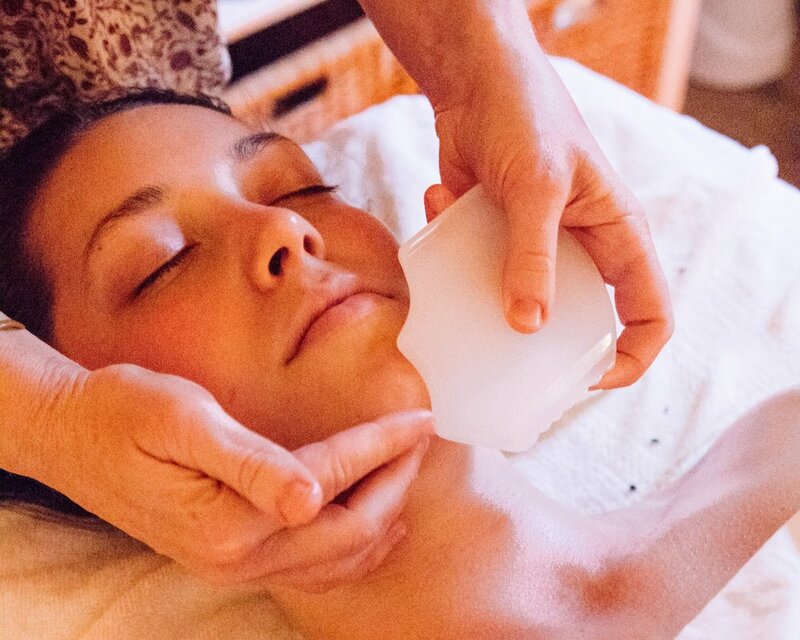 Extractions, LED Light Therapy, and a customized acne treatment plan combined with one of Misaotra's skin soothing detox massages paves the way to clearer, calmer, happy skin. For optimum results, this facial is best in a series of every 2 weeks for 3 months. An individualized home-care plan will be designed for you. Many factors contribute to this skin disorder, including diet, stress and lifestyle, which will be addressed in our one-on-one sessions. 'Dien Chan' is a form of reflexology. Reflexology implies the principle that by stimulating one part of the body, another part of the body is rebalanced. More precisely, when the skin (a major sense organ) is stimulated according to established maps which reflect all the organs of the body, the nervous system (central, then peripheral) responds to reach the targetted organ or area. It works to restore the correct flow of energy in the body. The body signals to us a problem by means of a pain or discomfort in the body. Such a symptom indicates an energetic block. Read more about this "Medicine of the Future" on the Dien Chan Zone page. Offering precision brow design, lip and chin hair removal. Complimentary brow fill included with brow wax using Arch Addicts, paraben-free and cruelty-free brow pencils. Wax services are performed with Nu-Free® botanical soy-based wax. Nu-free is a self-preserving, anti-bacterial, animal and earth friendly hair removal system. Brow and lash tinting also available using a safe, exceptional long lasting result of lush rich color. Want to learn more about living consciously and take a deep dive into the world of Deep Green Beauty? If you are looking to improve your health and home through wholistic living but don't where to start, then the PRAJNA 1:1 is for you. In this one hour session we will discuss topics such as prioritizing ridding your skincare and home of toxins, how to eat a diet rich in nutrients for vibrant skin/body heath, best clean beauty supplements on the market, movement medicine, how to use essential oils for beauty and home health and so much more! It's really up to you. Constantly told, " I could talk to you all day. ", Wendi has decided to now offer you the chance to sit, share space, tea and knowledge. Upon booking your PRAJNA 1:1 session, you will be sent a questionnaire to unfold what it is you'd like to discuss. This session is booked in 1 hour increments. If you would like to share space longer than an hour, please book accordingly. This service also available via SKYPE or email. Contact for more information.